Google Now (that's the fancy cards and predictive assistant) for iOS was just released (you can download Google Now here) and integrated into the Google Search app for iPhone and iPad. If you install it and log in with your Google Apps account, you'll get an error that "your administrator hasn't enabled Google Now for your domain." You'll need to (or your admin will need to) turn it on for your Google Apps Domain. It just takes a moment. Note that you're changing this setting under Android but it affects iOS as well, which is why it's so unintuitive. Google Apps for Business, Education, and Government: Google Now needs to be turned on by an administrator before it can be used. Sign in to your Google Apps control panel. Go to Settings > Mobile > Org Settings > Android settings. Click the checkbox next to Enable Google Now to turn on Google Now. Here's a screenshot describing the flow, as it's not obvious. It took about 10 minutes for the setting to propagate. You may also need to force-quit the Google app for it to pick up the new setting. 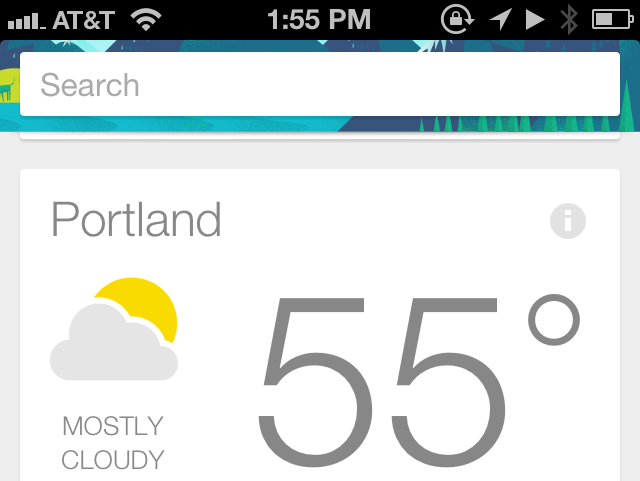 Your mileage may vary, but this IS how you enable Google Now, regardless of device. I hope this saves you time and frustration. Pass it on. Just a FYI, it seems you must have the business/education/government version of Google Apps. My domain is on the free version (before Google did away with it) and doesn't have the options your showing. 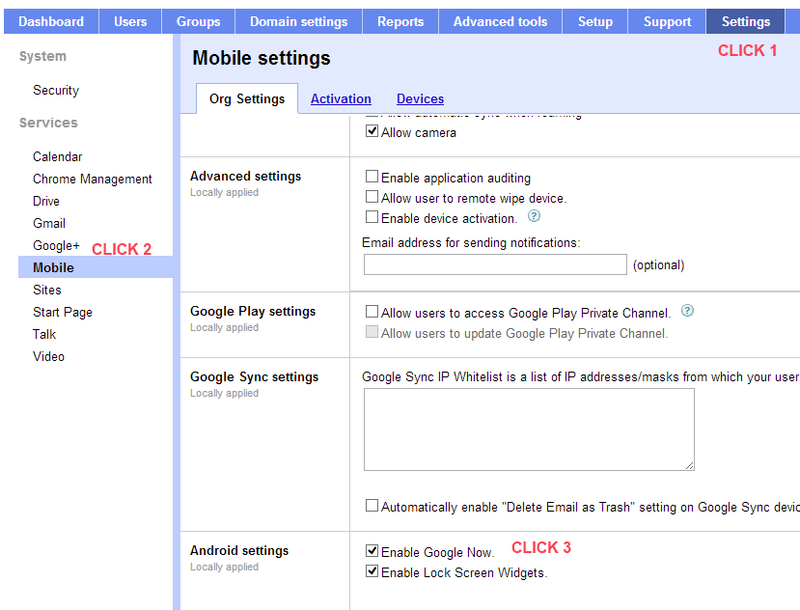 I only see "Enable Android Sync for users" and "Enable Google Sync for users under Settings -> Mobile for my domain. Stephen - Yes, for Free Google Apps this is turned on by default and (since with a FREE account, you are the product) there is no way to turn it off. Thanks for that Scott. I'd got as far as selecting Enable Google Now for Android devices, but hadn't tried quitting the app and restarting it - that did it. It looks like a great app. Thanks. That worked great. I Changed the settings and once I forced the app to quit and reopened all was there. Thanks Scott. Glad it's on by default. Thanks man. Odd place to turn on features for an iPhone, and the restart really threw me. On my iPhone 5, I had to manually shut down the app by double tapping the home button. There's an option to "try again" inside of the app, but it wasn't until I fully restarted the app that I was able to see Google Now. Thanks -- after 30 minutes figured it was the Android clickbox, but didn't restart the app on my iPhone. Figured "retry" would do it -- guess not. That's the most useful feature people of found with Google Now? Thanks for the instructions - spot on. Thank you very much for posting these instructions. I wasted 10 minutes looking for them in the Google Apps control panel before searching out the solution that you show here. Thanks.....I had found the setting but not gotten it to work. The key was the force quit and restart of the app. Quick question. Got it to activate but Google Now doesn't seem to be accessing my email or calendar. For example... for my wife's personal account she gets flight updates on Google Now after the check-in email is sent to her inbox. On my business account nothing although I got the same email. Any update on this for those using Google Apps for Business (paid version) and the New Admin Console/Panel? Scroll down to last option (Android settings) and click "Enable Google Now (also applies to iOS)." @James - Thanks for the location in the new admin console. Couldn't figure it out until I read your post.